This attractive, high-quality, low-maintenance metal roof is ideal for tight budgets. The 36"-wide panel is attached with self-drilling, stainless steel color-matched fasteners. 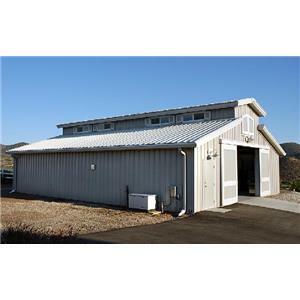 This metal roof system offers you enhanced roof integrity and quicker installation. Sealant is applied to every metal-to-metal contact point, resulting in a weather- resistant roof. The panels has 1-1/4" high ribs and comes in lengths up to 43&apos;. Panels are available in either 24 or 26 gauge zinc aluminum coated steel. Roof slopes as low as 1/2" in 12"